Please use the form below to request a Terminology Guide / Mylar Color Selector. The Terminology Guide / Mylar Color Selector is two tools in one. This tab set allows you to see accurate mylar color samples, just the way a PMS swatch book allows the communication of ink color. Additionally the Terminology Guide / Mylar Color Selector provides a glossary of the terminology used in custom tab manufacturing. 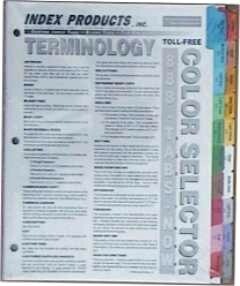 The Terminology Guide / Mylar Color Selector is an essential tool for both accurate mylar color selection, as well as, a glossary to assist in your clear communication of index tab related terminology. Finally, the best part...it's FREE.